I tend to pick costumes that provide some sort of challenge, or problem to be solved. 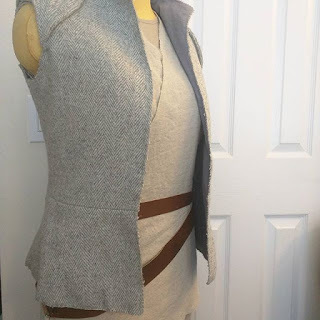 I wanted to make a Resistance Rey (Rey at the end of The Force Awakens) because her vest presented an interesting challenge. I decided to make an Imperial Staff Officer because I knew that both making the pattern and executing the tailoring would be satisfying challenges. With that project, I knew I had all the skills necessary to succeed, as much of the process actually mirrored the construction of many of my Victorian garments. Knowing I could pull that off also meant that it wasn't actually stretching my skills that much. I needed a bigger challenge. . .
Teenager - How much was your armor? TK - It was free. Teenager - Wow!!! Where do you get it from? TK - It's free when you join the Empire. Teenager - No, I mean how much? TK - You just enlist as a Stormtrooper . ..
No matter how much the teen tried, he couldn't get that TK to break! As an avid LARPer (Live Action Role Player) I loved it! 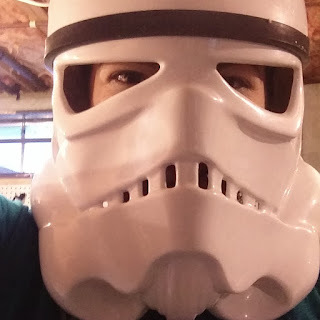 I think that was the moment when I knew I'd ultimately don the white armor. At a more recent event, I witnessed another interaction, which set me along the path to the dark side for good. . .
Teenager - Who's your dad? Teenager - Who's your mom? Teenager - Who's your grandpa? Teenager - Who's your grandma? And then I decided to jump in.